It’s not often that there’s much of a call to spend time on or around the roof of your property, except when it comes to general maintenance and the start and end of the holiday season. If you’re a fan of decorating your roof for the holidays, then you’ll already know just what a hassle clambering up and down the roof can be. Roof decorations can be a beautiful addition to any home during the holidays, but there’s a right and wrong way to go about this decorating project. To create the comprehensive guide that you need to nail (or not) your holiday roof décor, we’ve covered some top ideas for decorating your roof, tips and tricks for getting the perfect finish, essential safety advice, the dos & don’ts, and the biggest roof hack of them all. If you’re getting ready to decorate your roof for the holidays, this is the guide for you! If you have a garage full of exterior holiday decorations, then you may already have a plan in mind for how to go about this year’s decorating tasks, but you may find that there’s an easier way to get your décor on the roof…. Hanging the same lights in the same way every year can feel monotonous, and if your light-hanging method isn’t efficient, the whole endeavor can become very time-consuming. Luckily, there’s some top hacks out there to speed-up the process, and all that’s required is a little advance-preparation. Threading your lighting through a PVC tube, with pre-cut holes for the lights, is a great way to minimize effort and maximize results. Using a lighting pole, you can then lift the PVC tubes onto pre-attached hooks and decorate your home in just a few minutes! Similarly, attaching batch clips to your lights in advance, and then just clipping as you go, can save you both time and energy; not to mention making the whole project a little easier. There’s no crime in minimizing your holiday décor and just targeting the key areas of your roof for optimum results in certain areas. Illuminating your roofline is a great example of this; a beautifully illuminated roofline is a treat for the eyes and a relief to you, as it’ll take much less time than going overboard with your decorations. A roof isn’t designed to take a lot of weight, and neither is your back. Instead of focusing on heavy decorations, it will be a benefit to your roof and yourself to stick to lightweight roof decorations. Overburdening your roof is one of the worst things that you can do! Finding yourself up a ladder with only half of the tools that you need for the job is not only annoying, but a potential hazard as well. Before you dive into roof decoration this year, make sure that you have everything you need to hand. Can you imagine hanging all your holiday lights, only to turn them on and find that half of them don’t work? All it takes to avoid this nightmare scenario is double-checking that your lights are working in advance. For that extra peace of mind, check your extension cables at the same time! There are few better ways to make sure that a project goes to plan than by starting off with a plan. Working from the focal point of your décor out will help you to achieve the perfect finish, and speed-up the whole process of hanging lights and installing holiday decorations. A light hanging pole is one of the best investments that you can make to reduce the stress of getting your holiday décor in the right place. With less reliance on ladders and a quicker process, it’s a win-win investment. There’s a good reason why most roof jobs are left to the professionals, and that’s because clambering around on the roof is not the safest of activities to take part in. Between the chill of Chicago in the winter, and the potential of snow, if you don’t keep safety in mind, your holiday decorating project could easily take a turn for the worst. If your holiday decorating plan involves walking on the surface of your roof, then the right shoes are going to be paramount. Shoes that provide a good grip, are strong and durable, and offer your feet additional stability will help to make your time on the roof a little safer. If you’re not completely comfortable walking on the roof, it’s worth considering hiring a professional to finish up the job. A roof that is in poor-repair shouldn’t be overburdened with decorations, and it certainly shouldn’t be walked on if you’re not 100% sure that the surface is safe. Clearing the roof of any ice or debris with a broom before you walk on it is essential to make sure that there are no hidden dangers. A secure ladder is one of the most essential things when working on a roof, as not only is it your way up the roof, but your way down as well. If you’re using a ladder to secure clips, access the roof, or hang lights, then you need to make sure that it’s large enough for the job and completely secure. A secure ladder should be taller than the roof by 3 feet at least and be positioned on an angle of about 75 degrees. Working on a roof alone is a recipe for disaster. Having someone at hand to hold the ladder, pass you supplies, and provide a second opinion on whether your roof is safe is absolutely invaluable. If the worst happens and you have an accident, having someone with you will make sure that the accident doesn’t go unnoticed. For your safety, and the safety of your roof, it’s of the upmost importance to carefully plan where you’re going to put your holiday decorations. No decoration, be it inflatable or electronic, should be placed next to your chimney, power lines, vents, or trees. 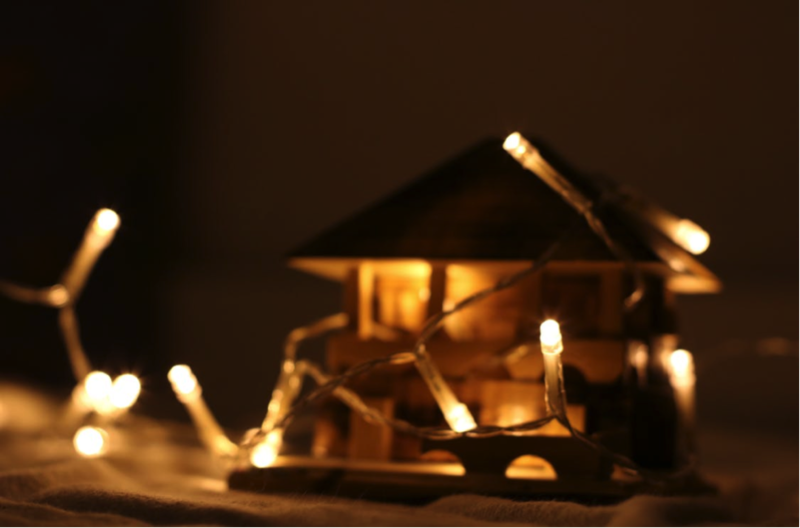 Chicago is not known for wonderful winter weather, and around the holiday season everything can feel like a rush, but that doesn’t mean that you should settle for a less-than ideal day to put up your décor. If there’s a chance of rain, the surfaces of your roof are slippery, or it may snow, don’t take the risk and start hanging your holiday décor! Do make sure that all holiday roof decorations are properly tied down. You can easily do this using clips or wooden frames for larger decorations. Do work with the roof, not the decorations. Even if there are decorations that you want to attach, if the roof isn’t suitable, it’s not a good idea. Do check that your decorations are suitable for the outdoors and the cords are protected. Do remember your limits. Knowing what you can and can’t do, and when to take a break, is paramount to staying safe when hanging your lights this holiday season. Don’t be tempted to load a steep-pitch roof with decorations. Decorations on a steep slope are a safety hazard, both during installation and afterwards. Don’t use staples to fasten your holiday decorations. Staples can cause a lot of damage to the roof, they aren’t very secure, and they won’t last through to the next holiday season. Don’t use nails to fasten decorations to shingles. Nails can lead to serious moisture problems during the holidays and throughout the rest of the year. Don’t use sandbags to keep decorations on the roof. While sandbags are effective at holding down decorations, the weight of the bags could damage your roof. Don’t overload your circuits. There’s a limit to how many lights you can safely plug into one outlet! Between decorating ideas, tips for decorating, safety advice, and the dos and don’ts, we’ve covered most of the key areas of holiday roof decorating, but there’s one major hack that we’ve not touched on yet – roof servicing and repair. Your roof does a lot for your property, from keeping your home warm to protecting it from the harsh Chicago winter weather. All that hard work can leave a roof in poor repair, which then makes it a hazard when you’re trying to decorate, and a potential risk to the inside of your property. One of the best holiday gifts that you can give your home this year, before or after the season, is to get your roof professionally serviced and repaired. A roofing expert will be able to spot any signs of damage on the roof or worry areas that could escalate into a much more serious problem. After an expert eye has surveyed your roof, you can schedule any necessary repairs that will make sure your roof is in excellent condition now and for the rest of the year to come. If you’re after time-saving hacks to make decorating easier or the best finishing touches to perfect your exterior décor this holiday season, a roof in good-condition is the best place to start! Decorating your roof for the holidays doesn’t have to be time-consuming, difficult, or unsafe. Between our ideas, tips, hacks, advice, and dos & don’ts, you can master the art of decorating this year and set your roof up for a wonderful year to come.